“The problem and solution for Africa is education” Dion mentioned in one of our many intriguing conversations on our three day drive from Johannesburg to Lusaka. It struck a chord with me, as I believe that education is key to so much in this world. And to receive an education, you need not only access to it, but also a set of skills to engage with the information you are being exposed to. I attended a lecture in May 2010 where Dr Pretorius of WITS University shared how the foundation of all formal education is literacy, and specifically reading, as it creates new neural pathways in our brains. Her point was that the tipping point for developing these skills is going to be in the classroom, and that this needs to happen as early as possible for children. Challenges abound in Africa in terms of classrooms, educators and the tools needed to provide the space for a child to learn. The usual stories we hear are ones of classrooms being so overcrowded that children sit on the floor and share textbooks (if they have any). And that’s if they are actually in school, and not playing in the streets or working in the fields. Stories of educators either not arriving at class to teach and of those who are committed to help educate our future generations, but lack the resources to improve their own education to meet the demands required of them. It was so refreshing to meet today the team at iSchool and hear of another story. A story of where technology is providing an interactive form of education that is having such an impact, that- as an example- there is a school here in Lusaka where the children have become so eager to learn, and the educator is so committed to teach them, that she opens up the school on Saturdays to the hungry learners. 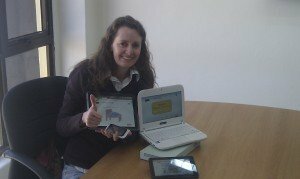 Right now iSchool is providing its total learning environment and full eLearning content for Grades 1 to 12 in Zambia, via an enquiry based active learning method, on the robust Intel Classmate laptops (just like the one I’m blogging on), connected to a small and hardy server that runs off solar energy. 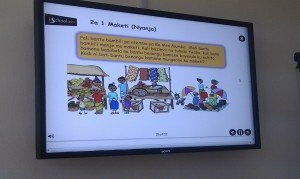 The lessons are available in English and 8 vernacular languages, which is helping younger learners to grasp the content in their home language, and also pick up English more quickly. Each lesson uses local examples with relevant reference points, which makes the grasping of the concepts being taught so much easier. And iSchool haven’t forgotten about the educators. They also provide full plans for them with training and mentoring. Plus the technical support needed for the IT equipment. iSchool appears to have a holistic approach and sustainable attitude. The quietly enthusiastic MD, Mark Bennett, showed us the android app they have developed, and I couldn’t help but cheer him on with a big smile, being an android fan! 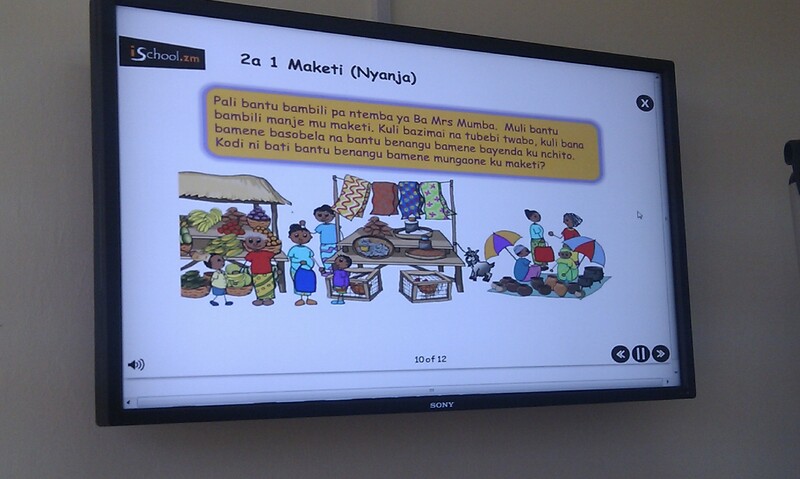 Mark showed us how their lessons can be viewed via smart phones, tablets and kindle fires. Believing that with the price of smart phones starting to come down, and connectivity becoming more accessible, people will be choosing android phones more often, within the next few years. And individual phones have a wide spread reach, especially in rural areas. It made me realise that my little HTC that I value so much for what it allows me to do, is now an even more valuable tool that can have an even bigger impact. And that is the crux of what I took away from my visit to iSchool. Every one of us sitting around that boardroom table in Lusaka knows the significant value of education, and that with the right technology it can play a key part in opening up minds and changing lives for the better. The point emphasised though, was that it is not about the technology – it’s about the education. The laptops and phones and internet are just the tools – it still comes down to people using them to create the neural pathways in their brains, that allow for the benefits that education brings. With tears of inspiration and awe in my eyes, we drove away from iSchool, planning a visit to one of their schools next week. My heart is also full of hope from experiencing this iSchool story of passion, commitment and attitude of sustainability that has children eager to attend Saturday School. This entry was posted in Palace Expedition and tagged education, iSchool, technology by CA. Bookmark the permalink.